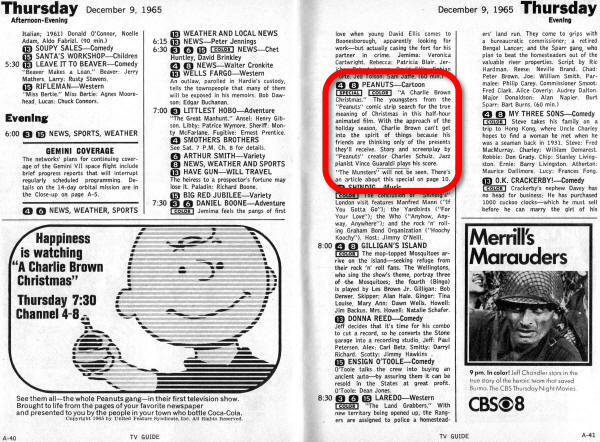 First TV Airing of "A Charlie Brown Christmas"
Before the advent of YouTube and other video sharing venue via the Internet, broadcast television was THE medium for visual entertainment other than an occasional jaunt to the movie theater. You either watched shows when they first aired or hope to catch them on reruns. TV Guide was THE go-to publication for all things television. Out of print now, it was for many of us the schedule setter for Saturday morning cartoons and Prime Time comedy shows. As a lifelong admirer of Charles Schulz's Peanuts comic strip, I occasionally buy a collectible item like a Snoopy music box that plays "It's a Long Way to Tipperary," a plastic Schroeder and piano figurine, a Charlie Brown Skediddler, or a Snoopy astronaut from the Apollo era. This time I bought the edition of TV Guide that announced the first showing of the "A Charlie Brown Christmas" cartoon. Also in this edition is the announcement of plans to preempt regular programming to televise the launch of the Gemini VII spacecraft, which carried astronauts Frank Borman and James A. Lovell. It launched right on time at 2:30 pm on December 4th. "As his millions of fans long since have discovered, under that inept, ineffectual, bumbling exterior of Charlie Brown's there beats a heart as soft and sweet as a marshmallow. In the sequence on these pages, drawn exclusively for TV Guide by Charlie's creator, Charles Schulz, he becomes concerned about the true meaning of Christmas, finally comes up with what he believes is the answer. And despite the skepticism of his friend (?) 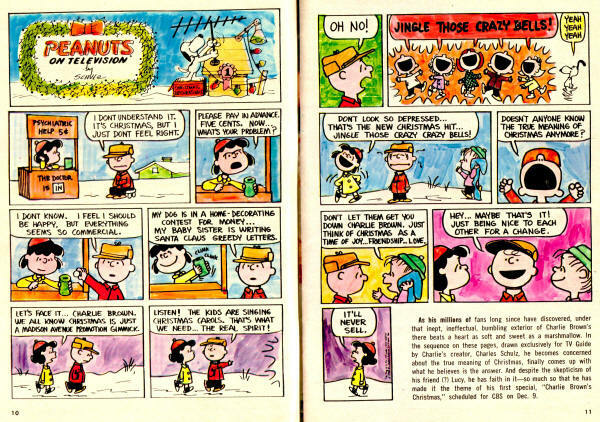 lucy, he has faith in it-so much so that he has made it the theme of his first special, "Charlie Brown's Christmas," scheduled for CBS on Dec. 9." See my modest Peanuts nostalgia collection and Snoopy alarm clock.